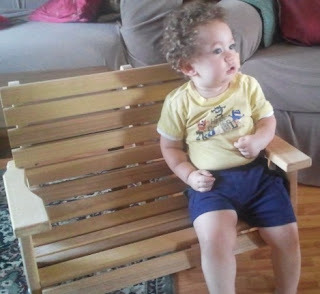 While we were traveling last week we found a small bench just right for a toddler. We found the bench at a small store selling Amish made rocking chairs and out door furniture. The bench was not stained or finished but very pretty. 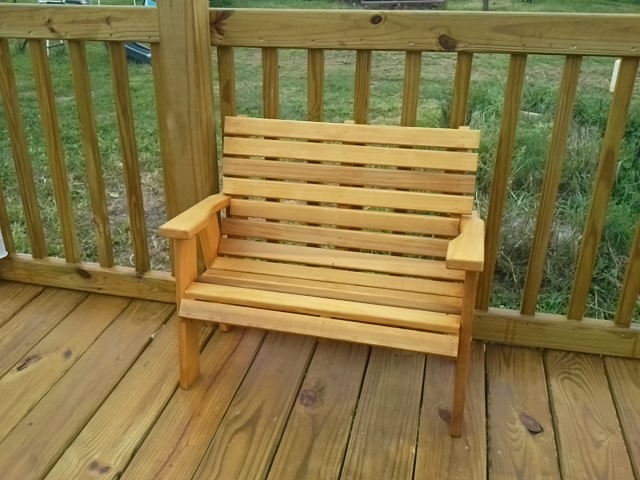 This is the bench unfinished. Little Bug had to try it out. We had some left over stain/sealer that we used to stain our deck. The color was honey gold so we decided it would work for this little bench. This is the bench finished. The color came out lighter than the deck because the wood types are different. Just like Baby Bear said, "This one is just right!" That is just adorable. And just the perfect size for a little one. I love the stain on it, very pretty color. Very crafty! Thanks for following. Following you back! 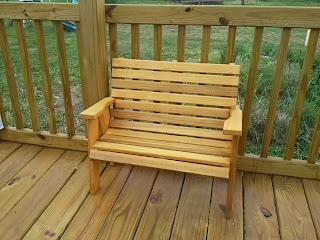 I love the finished bench - it's a perfect size! Looking forward to reading more of your posts. I love the pics! The bench is great too. I bet the girls will be happy to try it out too. This wonderful post totally contributed to the blog party's success! Thanks for linking up at Creative Bloggers' Party & Hop :) And I agree with your comment, these projects are so addictive that one can spend tons of time just looking at them. Hello, thanks for stopping by my blog earlier! It's refreshing to see a blog from a grandparent's point of view. Your other projects are also fascinating! Aww, its perfect! Thanks for dropping by Happy Hour. The bench turned out great. It looks like the perfect size for the little ones. That bench is great! Love it! The bench turned out great. Thanks for stopping by the firefly!! that is some pretty bench + very cute grandchild i must add! thanks for stopping by my blog.